For anyone thinking about starting an online business, this resource provides all the steps needed to take an idea and turn it into reality. 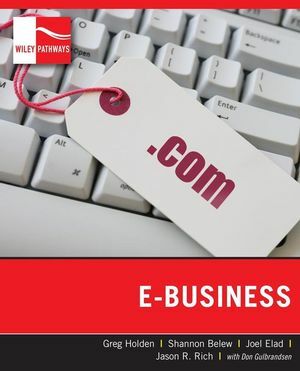 Wiley Pathways E-Business begins by discussing the legal considerations involved in launching the business as well as tips for acquiring the necessary financing. It also delves into the techniques to follow for operating the e-business, including selecting the right products, managing inventory, creating a marketing plan, and more. The book then covers how to create a secure Web site that can track customer data. Greg Holden is the author of more than thirty books on computers and the Internet. Virtually all of his books provide both entrepreneurs and small businesses, respectively, with the knowledge and tools they need to expand their operations to include the Internet. Some recent titles that Holden has been a part of include eBay PowerUser's Bible and Starting an Online Business for Dummies, both published by Wiley.